We are thrilled to announce Kristin Hildebrand as our May Mom of the Month! Kristin and Kate joined Our Village in February of 2016. Both of the Hildebrand ladies have beautiful smiles and a positive attitude. Kristin is always introducing herself to new moms and truly is a light in our classes. She began with Stroller Strides then added in Stroller Barre to her routine and also our latest running club! We're so thankful that you found us Kristin! Congratulations! Hometown: I currently live in Glen Ellyn but was raised in Austin, Texas. 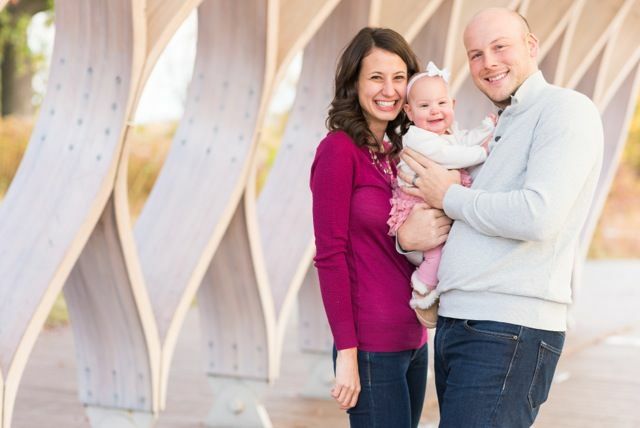 Tell us about who is in your family: My husband, Christian, and daughter Kate (13 months). What was your childhood ambition? Growing up, I wanted to be an elementary school teacher. I would always play school with my imaginary students. What does motherhood mean to you? I feel like I am still learning what motherhood means to me. Each day is a new adventure and when I finally feel I am starting to get the hang of it, Kate throws a curveball. I thought I was supposed to be teaching Kate, however, she has taught me so much about myself and life- to never give up hope, to enjoy in the little things and to find joy in all seasons of life. What is the furthest you have been away from home? Thailand- My Dad lived there for a couple years when I was in middle school. How as FIT4MOM changed your life? After Kate was born, I struggled to find the time, energy, and motivation to start working out again. F4M has introduced me to a village of inspiring women who keep me accountable and encourage me to reach my goals. I've learned that when I take care of myself, I can be a better wife and mom. Favorite exercise: I love to run. It helps me clear my mind and you can do it almost anywhere. Proudest moment: One of my proudest moments is when I qualified for the Boston Marathon. Ever since high school, I had dreamed of running it and finally qualified after two attempts of missing it by a minute.